Cibot rhizome (Gouji)-Cibotium barometz (L.) J. Sm. Botanical Name: Cibotium barometz (L.) J. Sm. Part Used & Method for Pharmaceutical Preparations: The rhizomes are dug in autumn. After the fibrous roots have been removed, the rhizomes are soaked in wine for one day, steamed, cut into slices and dried in the sun. Properties & Taste: Bitter, sweet and warm. 1. Deficiency of the liver and kidneys manifested as soreness and pain in the lower back and knees. 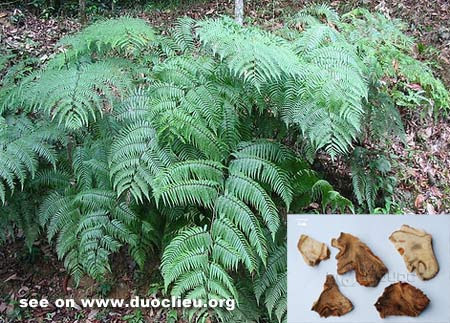 Cibot rhizome (Gouji) is used with Eucommia bark (Duzhong), Teasel root (Xuduan) and Cyathula root (Niuxi). 2. Deficient liver and kidneys accompanied by invasion of wind and dampness manifested as soreness and pain in the lower back and knees and motor impairment. Cibot rhizome (Gouji) is used with Cinnamon twigs (Guizhi), Large-leaf gentian root (Qinjiao) and Futokadsura stem (Haifengteng). Cautions & Contraindications: This herb is contraindicated in cases with dysuria, scanty, yellow or brown urine, bitter taste in the mouth or dryness of the tongue.